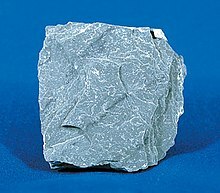 Slate is a metamorphic rock. It is formed from shale by being under pressure and moderate heat. Shale itself is formed from muddy clay, splits into thin plates. This characteristic splitting is carried over into slate. Schist is a rather similar type of metamorphic rock. Roofing slates are used in many countries, though ceramic tiles have gradually taken over. Heavier slates can be used for flooring (inside and outside). Slates are used for the cladding (surface skin) of buildings, and sometimes in Wales there are whole buildings of slate. Gravestones and memorial plaques are another use. Thick slate is used for billiard tables and laboratory bench tops, where its resistance to temperature changes and chemicals is useful. Slate was used for blackboards and writing tablets in schools. This page was last changed on 8 November 2017, at 00:58.